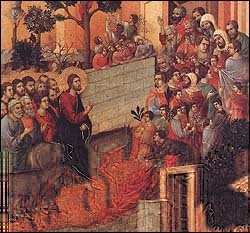 Duccio di Buoninsegna, detail, Entry into Jerusalem (1308-11), tempera on wood, Museo dell'Opera, From the reverse central part of the "Maest�" del Duomo, Siena. Larger image. 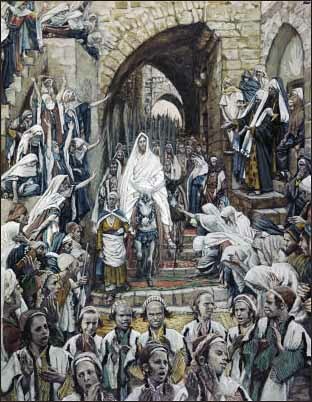 Adel Nassief, Entry into Jerusalem (1990) tempera and gold on wood, St. Mary Church, Amsterdam, Holland, Coptic icon. George & Diana Voyajolu, Iconographers, Kamena Vourla, Greece. 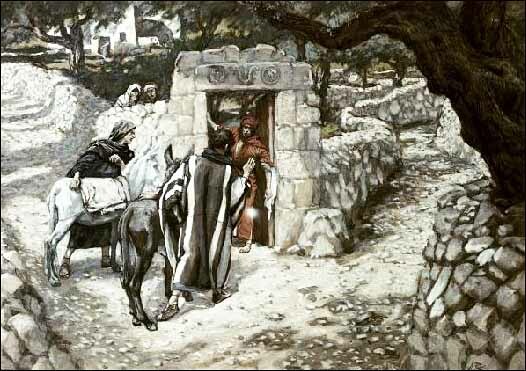 The Entry into Jerusalem. Byzantine style, contemporary artists. 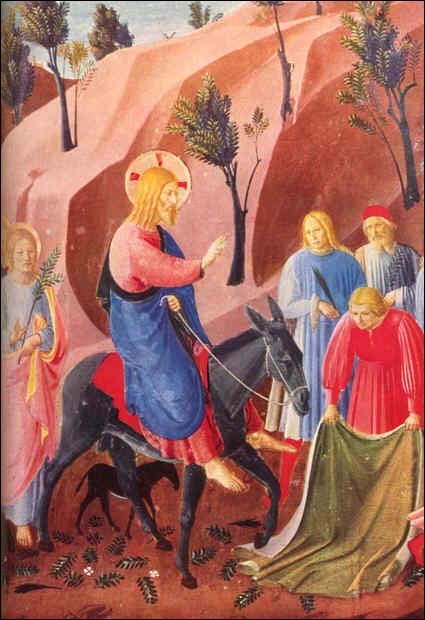 Pat Marvenko Smith, The Triumphal Entry, Standard Publishing Co.
Duccio di Buoninsegna, Entry into Jerusalem (1308-11), tempera on wood, 100x57 cm, Museo dell'Opera, From the reverse central part of the "Maest�" del Duomo, Siena. Another. 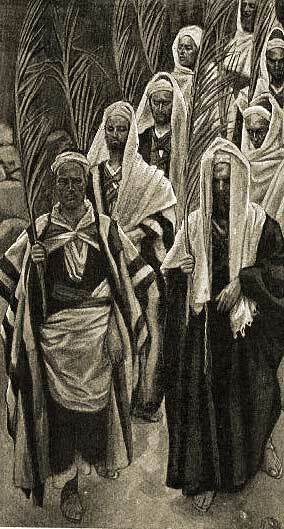 Gustave Dor�, Entry of Jesus into Jerusalem (1865), engraving from La Sainte Bible. 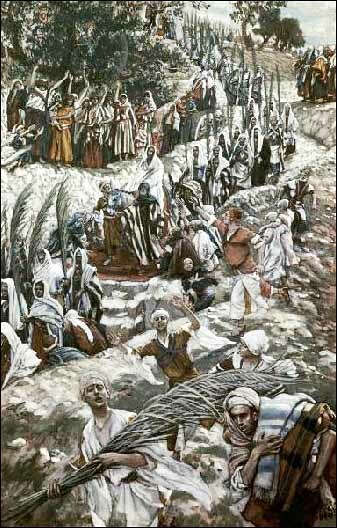 Benjamin Robert Haydon (1786-1846), Christ's Entry into Jerusalem. 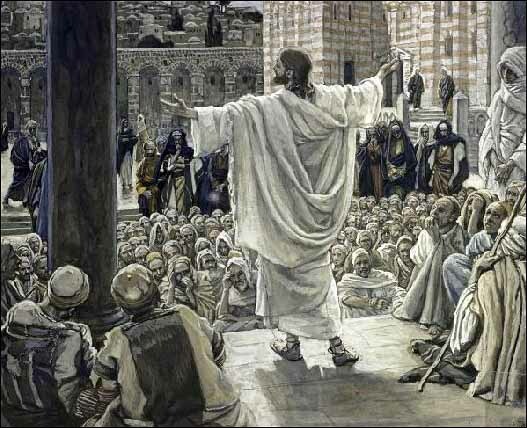 James J. Tissot, 'Jesus Beheld the City and Wept over It' (1896), Brooklyn Museum, watercolor. Larger image. 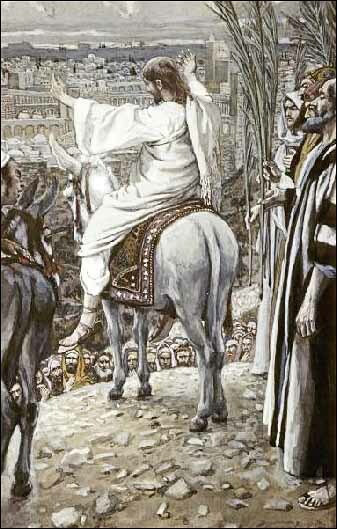 Alexandre Bida, Triumphal Entry into Jerusalem, engraving, from Christ in Art by Edward Eggleston (1874). 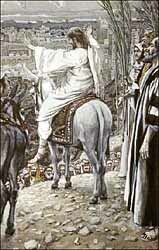 Siegfried Detler Bendixen, Christ's Triumphal Entry into Jerusalem, from Bible printed by Edward Gover, 1870s. 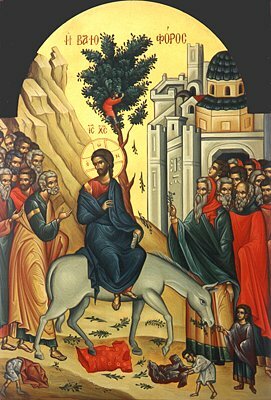 Triumphal Entry into Jerusalem on Palm Sunday, north wall of north transept, right in Trinity Church (Episcopal), Torrington, CT. Executed by Henry Eldridge Goodhue Company, Cambridge, MA, Mar 22, 1909, Walter G. Ball designer.